Greetings from Woolpit in Suffolk, England! We’ve recently arrived here after a ten day adventure in Norway, where we had a memorable time with wonderful friends, old and new. Norway is such a picturesque country, the people are gracious and the food is superb. I’m feeling very inspired about the local delicacies that I’ve been devouring in Norway and here in England and I’m super excited about getting back into my own kitchen in Dunedin, New Zealand and concocting some deliciousness. I’ve been dreaming about being reunited with my food processor and making all of the dishes I’ve not been able to make on this trip without it. Living in many different abodes over the past three months has really made me appreciate exactly how good my kitchen is back home and what is essential, which has consequently been a good exercise in being truly grateful for all that I have, bless. We have another week here in the Northern Hemisphere and I’m savoring the fresh autumnal produce before I get to enjoy the spring delights of home. So much to look forward to – hurray! The air has been feeling very autumnal here in Scandinavia and England. Leaves are fluttering about the paths and the evenings are fresh, as the summer dream is over for another year. As saddening as it may be that the warmth of the sun has dissipated, autumn brings with it an array of fresh fruit and vegetables which are very dear to many. Figs are one of my absolute favorites and have arrived at the markets, which makes me very, very happy. Ecstatic even. Figs are the shining jewel in the autumnal crown. A fruit like no other, their taste and texture is very unique. As you take a bite, the chewiness of the skin, the crunchy popping of the seeds, the luscious flesh and the saccharine sweetness exude one great whack of sensory indulgence. In addition to tasting amazing, figs also get the Super Foodie tick of approval as their health benefits are many. Figs are an excellent source of dietary fibre, which assists in keeping you full for longer, which is good news if you are trying to lose weight especially as they are low in calories. The high fibre content in figs is also beneficial in keeping your bowels in tip-top shape and works wonders in relieving constipation. Figs are a good source of potassium, which helps to control blood pressure and also calcium, which assists with increasing and maintaining bone density. Figs also contain magnesium, copper, iron and manganese for an additional dose of goodness. When purchasing figs, select those with a deep colour and which feel plump yet tender and ensure that there is no bruising. As figs are highly perishable, keep refrigerated, wash right before you are about to serve and eat within two days of purchasing to ensure they are at their absolute best. I love to eat figs simply on their own or with some Greek yoghurt, honey and nuts. However, the ultimate figgin’ combination is this one – a fragrant goat cheese (or chevre, as it is called in some places), the freshest, juiciest figs that you can find at your local market, walnuts and nectarous honey. Food of the gods, I say. On four plates, drizzle a small portion of honey in the middle of each of the plates. Cut the goat cheese into four slices (50 grams per person) and place on the drizzled honey. 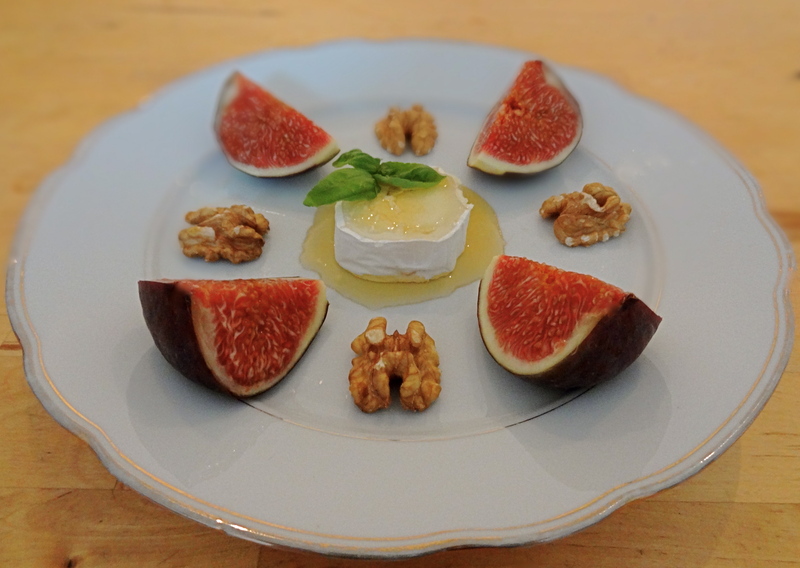 Arrange the quartered figs and walnut halves on the plate. Drizzle more honey on top of the goat cheese, garnish with fresh herbs and season with cracked pepper.